Thermostats are getting a lot smarter. Because almost 50% of the average electricity bill is for heating and cooling the extra cost is certainly justified. But despite the potential of programmable thermostats to save on power bills that have been a total failure. New high-tech devices offer a better way that should work. 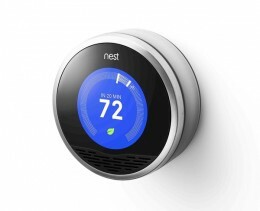 The range of smart thermostats range from simple programmable units, built into many heaters and air-conditioners, to devices that can be controlled using you smartphone to the latest device called 'Nest' the Learning Thermostat. Smart meters also offer the potential to save money, but there is recent doubt about whether or not they will change habits enough to save power. The benefits probably reside with the power companies who can change the cost rates at different times of the day. This article reviews these devices and examines whether they are worthwhile. While the programmable thermostat that has been around for more than 20 years the EPA and various research studies have shown little or no energy savings. Users find them very hard to use and they are designed for a fixed a regular pattern for home use and work-home schedules that don't really work and there is no way of incorporating flexibility into the system. This means that if you come home work early the house will be freezing. The thermostat can only be changed manually not remotely. 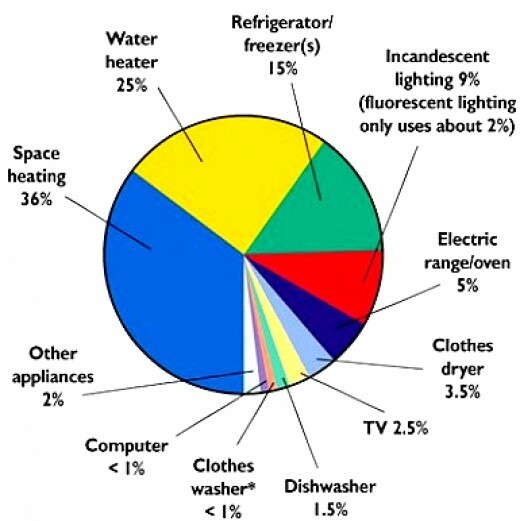 Some research studies have indicated a slightly increased consumption as the heating and air-conditioner are run at times when you don't need them. Its a bit like automatic sprinkler systems that you see watering lawns in the rain. One design that has been on the market for some time is the ecobee Smart Thermostat. 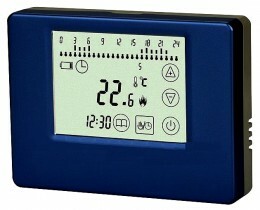 It is a WiFi using programmable thermostat that is easy to use at home and remotely. It has a full-color touch operated screen with many very helpful programs to assist run the programming simply and easily. A convenient setup Wizard guides you through all the simple steps required to link the unit to your heater or air conditioner and the various programming steps and option. The WiFi enabled Smart Thermostat provides remote access via smartphones or any computer. You can control your system through a secure and password protected web portal via an Internet connection. 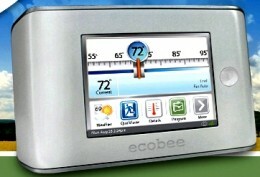 You can download the ecobee Smart Thermostat iPod Touch and iPhone apps free of charge from the iTunes store. One major advantage of this unit is that it provides very comprehensive reports that helps you track the performance of your heating and cooling system. This interfaces very well with smart meters so that you can adjust when the units are operated to take advantage of off-peak rates. The reports provide summaries of your system's heating and cooling and temperature control over a 3 day period or for any single day after the unit was installed and was operating. The Nest Smart Device, which has just been released, is really smart. It adjusts the temperature based on the weather, the presence of people in the house and it has the ability to the home use habits of the residents. It can also teach itself about the house's cooling and heating patterns and the various delays to optimise its performance so that the house is not cold when you come home. The programs can be overidden remotely if you decide to come home early. It will automatically lower the heating or cooling if their is no movement in the house because the family has left early. The unit also adjust itself to the weather conditions. The manufactures claim that this device could cut 20 to 30% off the average household's energy bill. The Nest device is about 10-20% more expensive than a standard at about $250 (£156), but this price will be quickly paid for via the savings if it works as claimed. The Nest addresses the thermostat programming problem by employing a combination of sensors, software, various algorithms, smart machine learning, and cloud computing. The Nest also supplies various information and tips to help users make smarter decisions about saving on power bills. It runs its programs by itself based on the various temperatures you provide to it. The Nest takes about a week to learn your family's habits and home schedule in a week and then it begins automatically turning down the cooling and heating when you’re away from home to save energy. The Nest keeps refining its schedule over time and can learn weekend schedules. Saving Energy Tips – Nest tracks the temperatures you set for various time of day and displays a green Nest Leaf when you adopt its suggestion for a more energy-efficient setting. An Auto-Away feature uses movement detectors and other sensors to sense when you’re not home and automatically lowers the temperature to save more power energy. You can display the Energy History for a report on how much energy you saved. Remote connection – You can connect to the Nest though your home’s Wi-Fi system and to control the Nest from your laptop, Iphone Android Phone, other smartphone or tablet. You can easily change the temperature if you are coming home early, re-program your schedule and get a summary of your energy usage. The Nest is very easy to Use – You can simply rotate the outer ring on the wall mounted unit to adjust the temperature. The display signals when heating or cooling are occurring - turning blue when cooling and red when heating. Simply push on the screen to open the menu. Easy to Install – You can easily have it installed professionally of do it yourself. Virtually everything you need is supplied in the box. Thoughtful Stylish Design – The brushed stainless steel frame is very attractive and blends with all wall colors. Use the hot-room principle and only the parts of your home that you're using, especially when the whole family is not at home. Use personal gas or electric space heaters in the rooms that you actually use. Adjust the internal environment of your house and life-style so that you can remain comfortable at lower temperatures. This includes putting rugs on bare floors, using ceiling fans in summer and winter to keep the air circulating, keeping the internal doors closed and keeping yourself warm with extra clothing and personal heating devices. Gas-based Central systems are moderately expensive to install, but they're generally much cheaper to run. Electric-based heaters and air-conditioners are generally cheap to install and portable but can be very expensive to operate. Insulate your home thoroughly to keep heat from getting into your house in summer or escaping in winter. This include curtains on windows, double-glazing and devices to stop draughts under the doors. Use rugs on floors and wear shoes or slippers. Wear more clothes and get used to wearing jumpers and jackets inside your house. Turn off the heat overnight and use more blankets. If necessary is as smart radiant heater in the bedroom (thermostat controlled) to take the chill off. There is a great deal of uncertainty about how many householders will change their behaviour enough to save power when Smart Meters are introduced in Britain, with over house to have one by 2020. At the start consumers are to be slugged £6 year for the device with best estimates and the average saving being £23 a year. Smart Meters benefit the supplier not the consumer because the supplier can vary the rates throughout the day. Consumer groups and the National Audit Office have claimed that few if anyone will save any money. If the notary upon execution of the instrument determines that a valid Epc is available for conscious residential building, he then put the VEA will immediately informed. If no EPC is present, the owner will be invited to a hearing. The owner is at risk of a fine of between 500 and 5000 euros. Consider using energy efficient light globes, such as LEDs as an alternative to general lighting and avoid halogen down lights. Switch off appliances not in use at the wall. The cost of appliances which are switched on and not being used (on standby) can add over $100 on your annual power bill. By washing your clothes in cold water and drying on a line or rack, you can save up to $100* a year. Compare your electricity suppliers to check you are getting the best deal on your rates at www.yourchoice.vic.gov.au. Have a free standby power controller installed to save money and electricity. Standby power controllers automatically cut off power to your electronic devices when you switch them to stand-by mode by pressing the on/off button on your remote control.